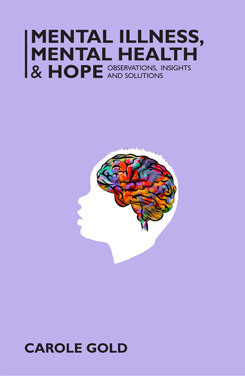 Mental Illness, Mental Health and Hope: Observations, Insights and Solutions is a series of essays on the many aspects of mental health and the challenges we face in finding and maintaining our emotional center in a highly stressful world. These are highly personal stories combined with practical guidance gained from living with depression, surviving attempted suicide, and having developed the inner strength and determination to accept one’s individuality and live one’s own truth. Carole believes that each of us is meant to use the challenges and struggles we experience to grow but also to share with other so that they can know there is light at the end of what, too often for too many, seems like a never ending tunnel.